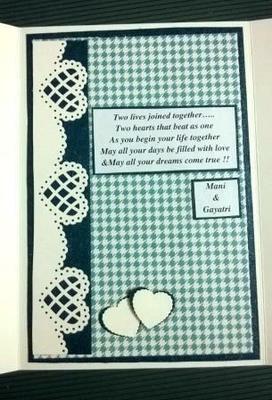 I made a gate fold card as a congratulatory card for marriage. I didn't include flowers cos I had to give this to the bridegroom... The inside of the card, I made more attractive with a strip punched using Martha Stewart punch. 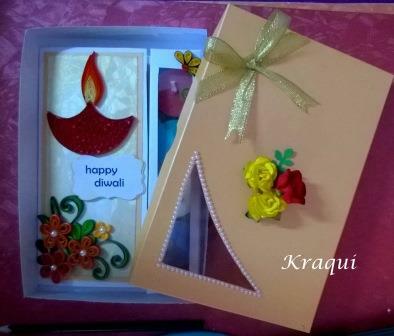 Diwali is a festival of light celebrated in India. 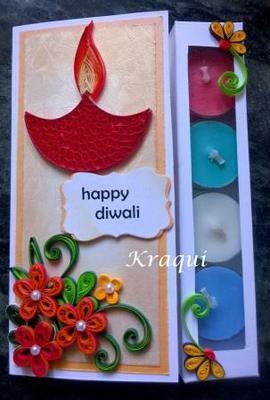 A tealight candle card is perfect for the occasion. I made a quilled 'Diya' or lamp and quilled flowers to go with it. I added scented candles and made a box cover matching with that. 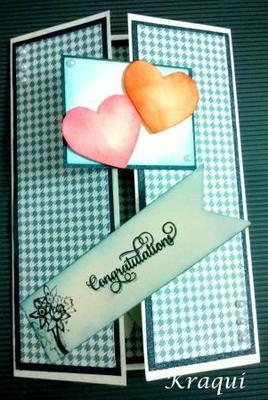 This finished project is so pretty and I love the different colored candles in your box. I am sure it was very well received and perfect for such an occasions. It is interesting to know how different countries celebrate the special times in the year and what type of gift is given. Really pretty cards, like the matching box too. Hello all. Thank you so much for those lovely words. It means a lot to me and keeps me going. What lovely cards, and yes, what Christiana said, different, I'm glad I'm not the only one who can't master the quilling technique Maybe one day. hello, really beautiful cards and boxes! good work.